What do Alice Walker, Gloria Steinem, Eve Ensler and Angela Davis all have in common with Sarah Shourd, an American journalist who was imprisoned in Iran for over 400 days? 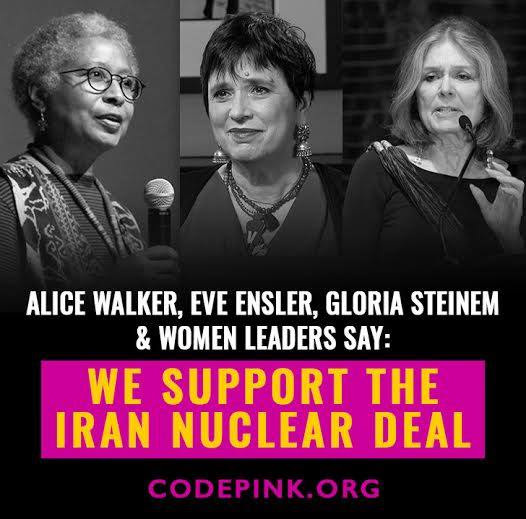 They all support the Iran nuclear deal. These women are part of 100 Remarkable Women in support of the deal. Will you add your name, and share it with your friends? Our DC team will deliver the statement with all the signatures to the undecided female members of Congress the day they get back from August recess on September 8th. You can also call these undecided Congresswomen. Call the Congressional switchboard now (202) 224-3121 and ask for one of the offices. Tell them you support the deal and they should too!Then make the next call. We've also teamed up with our friends at MoveOn.org to plan vigils for peace across the country on Thursday, September 10 at 6pm local time. With the vote expected to happen at about that time, this could be our last chance to send a message loud and clear to Congress.Can you host a vigil in your town? Let's make a major push this week for diplomacy. With your help, we can win this one! PS: Sign up for our Thunderclap to spread the word about #WhyDiplomacyWorks!